Quick and easy way to add fragrant spices to pine cones. I was looking for an easy way to make scented pine cones, but most methods involve painting the pine cones with white glue. When you’re in the middle of the Christmas rush, sometimes you need shortcuts – so I designed a recipe that uses spray glue, a plastic shopping bag and mixed spices. Although the technique is fast-tracked, these scented pine cones smell divine (using a mix of cinnamon, cloves and pickling spice) – but you can personalize the fragrance, if desired, with the addition of essential oils. 1. Mix pickling spice, powdered cinnamon and cloves. If desired, sprinkle with essential oils (some suggestions: sandlewood, patchouli, orange, cinnamon, balsam) and mix thoroughly. Set aside. 2.. Put the pine cones into a large plastic shopping bag and spread them out so they form a single layer at the bottom of the bag. See photo at right. 3. Aim the spray adhesive directly onto the pine cones, but stand away from the bag to avoid breathing in any overspray. Quickly close the bag with your hands and shake it thoroughly to turn the pine cones over. Open the bag, allowing the pine cones to settle in a single layer at the bottom, and re-spray with glue. 4. Empty the pickling spice mix over the pine cones, close the bag again with your hands and shake thoroughly to distribute. Empty the pine cones into a pie dish, or something similar, and allow to dry. 5. 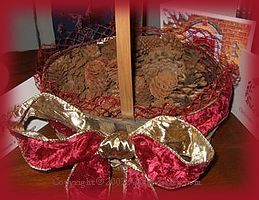 Place the scented pine cones in a mesh bag (a recycled onion bag works well) or sieve. Shake and stir the pine cones to dislodge any spices that aren’t sticking to the glue. If you’re using the mesh bag to enclose the pine cones for gift-giving, tie the bag closed then enclose in a clear plastic bag tied with ribbon. Decorate or wrap as desired. 6. To present the scented pine cones in a basket, place the mesh bag full of pine cones into the basket, allowing the edges of the mesh bag to show above the basket rim (as shown in our photo, above). Or, you can simply empty the pine cones into the basket, decorate the basket with a wire-edged ribbon, and enclose everything in festive cellophane wrap tied with curling ribbon.